This axial CT image with oral and intravenous contrast demonstrates a fluid collection containing mottled air occupying the pancreatic body and tail with extensive peripancreatic fat stranding. 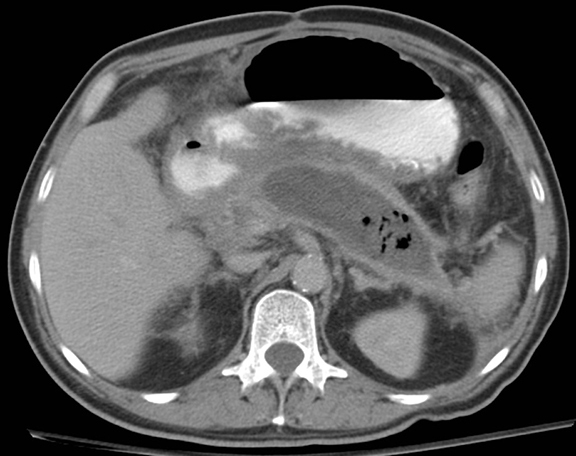 Classically, necrotizing pancreatitis is characterized by a diminished or lack of parenchymal enhancement on IV contrast-enhanced CT. When evaluating necrotizing pancreatitis, it is important to determine the extent of necrosis and to differentiate this entity from a pancreatic abscess or infected pseudocyst. The extent of necrosis can be quantified either by using the percent of gland involvement or the anatomic sections involved. Additionally, the Balthazar computed tomography severity index (CTSI), an imaging prognostic index, can be used to assess morbidity and mortality. Secondary infection of necrotic tissue is a recognized sequela in necrotizing pancreatitis. Differentiating sterile necrosis from abscess or infected pseudocyst is difficult, and in some cases impossible. Therefore, CT or US-guided tissue sampling may be necessary. Secondary infection in this unfortunate patient with necrotizing pancreatitis and high CTSI was confirmed upon CT-guided aspiration. Kreuer S. At the Viewbox: Acute Necrotizing Pancreatitis. J Am Osteopath Coll Radiol. 2012;1(4):41. Dr. Kreuer works with the Department of Diagnostic Radiology, Botsford Hospital, Farmington Hills, MI.